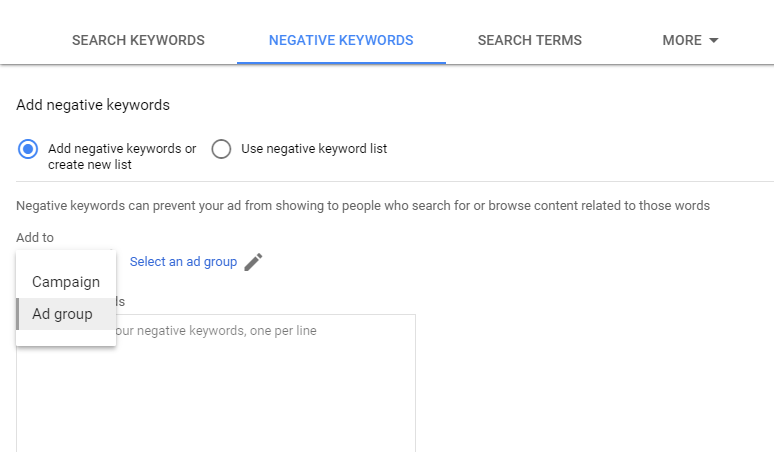 How to add negative keywords on different levels of Google Adwords account? 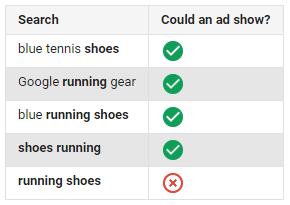 The main goal of using negative keywords in Adwords campaigns is reducing the number of unrelevant visitors and as a result, reducing the Customer Acquisition Cost (CAC) from this channel. We can distinguish the following types of negatives. Google Adwords Keyword Planner is the most used on the first steps before launching campaigns. It helps to add some the most popular negative keywords, but it’s not enough. Search Console is the second important source. If you have much organic traffic, it’s a big chance that you’ll find many valuable queries in Console for improving negative keyword lists in Adwords. All queries, that launch your keywords in ads, are collected in your account. So, every day, week or month you can expand your negative keywords list with new words, phrases. Kparser helps to find a big list of negative keywords depends on specific query. Generation of long tail keywords is one of the fastest methods to gather a list of negatives for ad group or campaing. 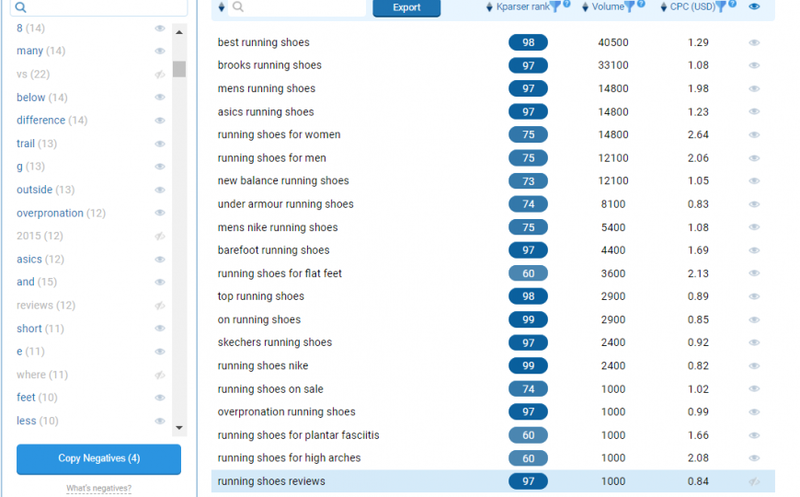 For example, after collecting results for query running shoes, we’ve got 1170 phrases and 834 unique words. 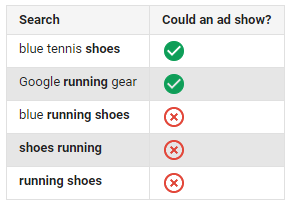 And your purpose is to collected as big as possible list of informational (not commercial) words to expand the list of negatives in Adwords. Look at the screen below. It’s really easy to check all words you find as negative keywords and press ‘Copy Negatives’. One click and all terms are in your clipborad, ready to be added to Adwords. Open the first 10-20 URLs from Google SERP by query ‘negative keywords template’ and combine as big list of negative keywords, as you need. What the way is better? The most convenient path is to create the list of the most general negatives on account level and add it to campaigns. Lists those are specific only for some campaign, ad group would be added on this specific level. Kparser is a free keyword research tool that can come in handy. It takes some time to run, but you’ll be amazed by the variety of keywords it returns. It’s easy to use and doesn’t require registration.